I have our boxer Jack’s toys, leashes, vitamins, grooming tools and treats scattered all over the house. I had never heard of a pet organizer before but I fell in love with the one that I received from Yep Yup. This Hanging Pet Organizer is stylish, sturdy and has lots of room to keep all of your pet products in one place. I mounted it on the wall and it was very easy to hang up. There are numerous pockets and I like that there are assorted sizes. There are seven styles to choose from so it is easy to find something stylish to fit in with your décor. In fact, I immediately started thinking about all the ways that I could use this product for myself particularly for organizing all of my home school supplies and craft projects. 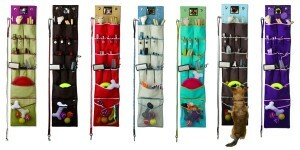 To purchase the Hanging Pet Organizer by Yep Yup for $59.99 you are invited to visit their website. You can also “like” Yep Yup on Facebook to receive updates and special exclusive discounts. That’s cool. Thanks for sharing.